According to a survey conducted by AARP, those age 50 or older take on average six non-business related trips at least 50 miles from home each year. And Travelzoo, Inc, a global internet media company, tells us that 40% of Americans are planning to take more summer vacations compared to last year. The most popular type of vacation is the road trip, both for a short weekend or for a longer period of time. Going on vacation can be a much more enjoyable experience with a little advance planning to make sure that we all stay safe and healthy. Be sure to pack all your medications. Before you leave, check if you need refills during your trip. Most pharmacies will accommodate flexible refills when they know you will be travelling away from home. Also carry a list of your current medications, their doses, and the time of day you take them. Remember to actually take all your medications. Vacations often change our normal daily routine. It is important to make time for correct medication use during all the fun and new places that a summer vacation may bring. Asking others who are with you to help remember, or setting a small timer, carrying a calendar or using a pill organizer may be helpful. Be aware of side effects. Some medications can cause side effects related to more time outside in the sun, like increased sensitivity to ultraviolet (UV) rays. It may be helpful to review all medications with your pharmacist, and ask for further consultation with your doctor if you have any questions. Keep your fragile skin healthy—wear your sunscreen. Sunscreen will help to prevent sunburns if applied correctly. Try to apply it about ½ hour before exposed to sun and make sure to apply it more frequently if you are participating in any water-related activities. Shop for a sunscreen that protects you from both USA and UVB rays and also has a sun protection factor (SPF) over 15. Dress for comfort and protection. Try to pack loose, lightweight and light-colored clothing. Consider wearing some form of long sleeves to protect you from the sun, especially if you have sensitive skin. Bring a hat and sunglasses. Like sunscreen, choose glasses that block UVA and UVB rays for maximum protection. Drink water or other fluids. Keep drinks that won’t spoil, such as water, with you in your car so you can stay hydrated. Don’t wait to drink water until you feel thirsty because your body is already dehydrated at that point. The feeling of thirst decreases as one ages, so it is important to be proactive and drink fluids frequently throughout the day. Decaffeinated and non-alcoholic drinks are the best option. Take frequent rest stops while on the highway. It may be 25 miles until your next rest stop. Will you be able to make it? It is best to stop, refresh, and restart to avoid having an unsafe and uncomfortable drive while your bladder is full. Above all… Leave your worries at home, and have fun! 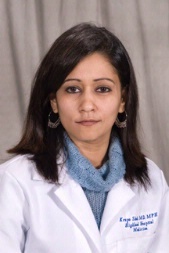 Dr. Shah is a member of the American Geriatrics Society’s Public Education Committee. This entry was posted in Health in Aging, Prevention and tagged safety, tip sheet by HIA Guest Blog. Bookmark the permalink. I also tell my patients to take along some medical information, such as a health summary and recent laboratory results. That way, if an urgent visit to see a doctor comes up, they’ll have some important information handy. Some older adults maintain a binder of health information, so making a copy of that information can be useful. There are also personal health records services that can be used. Great points Leslie. I will see if I can edit the blog to include your suggestion. I suppose along with taking important medical information, it would be a good idea to remember your insurance card as well. Possibly even research whether there is an urgent care facility or other medical center near place of lodging if going on a long trip. Planning ahead will make traveling as a senior an enjoyable and rewarding experience. Before you leave, share your trip plan with a family member or friend. During your trip, check in with them periodically to let them know you are safe. And don’t forget to take pictures to show them when you get back!